Both miles per hour and knot are unit of speed which is measured in the number of units of distance covered in a certain amount of time. Speed is the rate at which something moves or operates. The speed of an object simply is the magnitude of its velocity. It’s a scalar quantity which tells how fast something is going. Let’s say you are traveling, your speed is about 50 miles an hour on an average. This means you are able to cover 50 miles in an hour. If you manage to go any faster, you could cover as much as 70 miles in an hour meaning your speed is about 70 miles per hour (mph). If you drive a car or ride a bike, you’ve seen the speedometer which measures speed in miles per hour or kilometers per hour (kmph). Knot is just another unit of speed which is like mph or kmph, except it’s equal to one nautical mile. Speed of boats and aircrafts are generally measured in knots. One nautical mile is a minute of arc on the planet. This is a common measurement of speed used by all nations for air and sea travel. One nautical mile is exactly 1.852 kilometers, or 1,852 meters. In the English measurement system, one nautical mile equals to 1.1508 statute miles. Nautical miles are primarily used for navigation and charting. 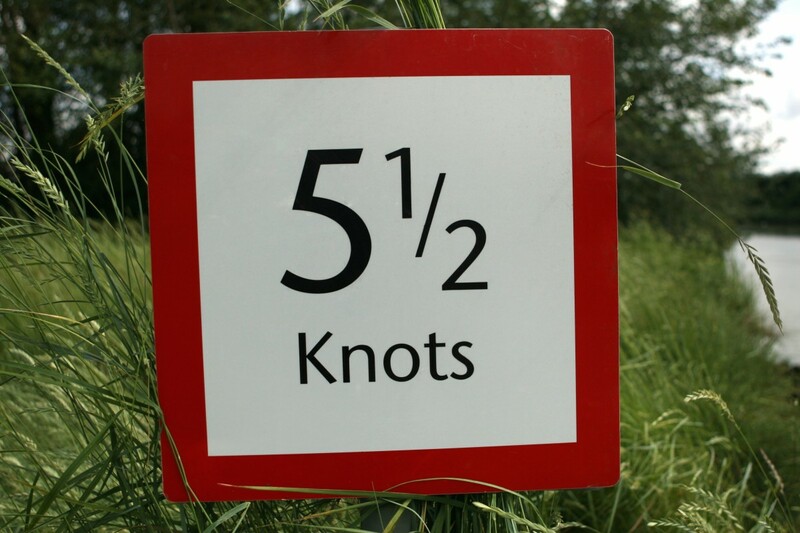 So a knot is basically one nautical mile per hour which converts to 1.1508 miles per hour. This pertinently equals to 1/60th a degree of one minute of arc. For example, let’s say a ship is traveling at a speed of 20 knots, it converts to 37.04 kilometers per hour or 23.016 miles per hour. 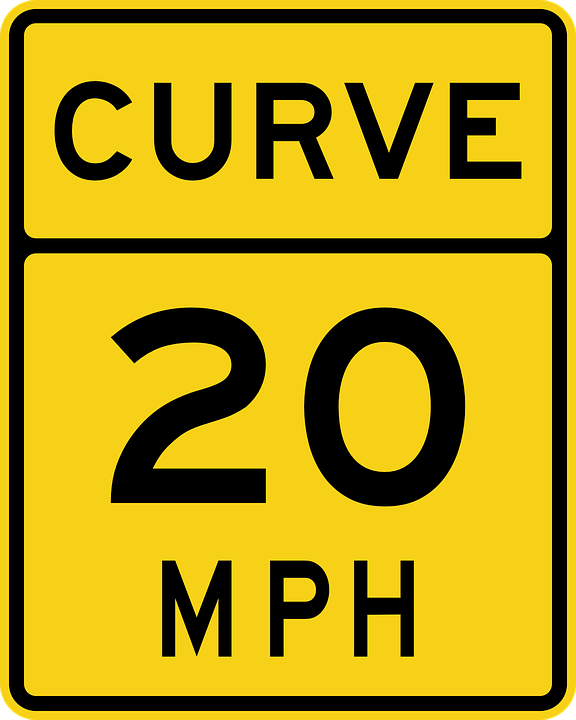 Miles per hour is a unit of measurement of speed abbreviated as mph. It is the number of miles moved in an hour. It is the number of units of distance covered in a certain amount of time. If a car is going at a speed of 50 miles per hour, this means it’s about to cover a distance of 50 miles in an hour. A car’s speedometer shows speed in miles per hour or kilometers per hour. Knot is also a unit of measurement of speed which equals to one nautical mile per hour. Speed of boat and aircraft are usually measured in knots. One nautical mile is a minute of arc on the planet. This means you drove the car at an average speed of 58.3 miles per hour to cover a distance of 350 miles in six hours. Speed is usually measured in miles per hour or kilometers per hour which is the standard unit of measurement of speed in general use. Knot, on the other hand, is a non-SI unit of speed, mainly used in meteorology, maritime charting and air navigation. Knot is primarily used to calculate the speed of boat and aircraft. The speed of tidal streams, wind speeds, and river currents are also measured in knots. The history of knot predates the standard unit of measurement of speed which dates all the way back to the early 17th century when sailors used a device called “common log” to calculate the speed of the ship. This was a common device – usually a length of rope with uniformly spaced knots and one end is attached to a wooden board while the other was secured to the ship’s stern. The rope was then tossed into the water. The rope was allowed to roll out freely as the vessel moves forward leaving behind the piece of wood for a certain period of time. The number of knots were then counted that unspooled which is used for calculating ship’s speed. 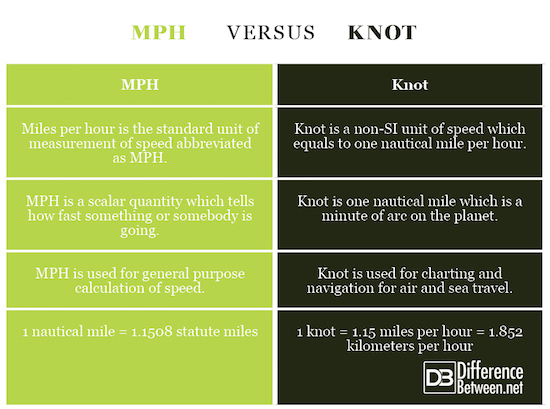 Both mph and knot is unit of measurement of speed which is measured in the number of units of distance covered in certain span of time, except knot is a non-SI unit of speed which equals to one nautical mile. A nautical mile is equivalent to one sixtieth of a degree of latitude. Knot is mainly used for sea and air navigation. It gives the link between the distance and longitude and latitude. Nautical mile has a greater significance in navigational calculations and is based on the length of a minute of arc along the Equator. Simply put, one minute of arc on the planet is called as a nautical mile which is based on the circumference of the Earth. Sagar Khillar. "Difference Between MPH and Knot." DifferenceBetween.net. September 20, 2018 < http://www.differencebetween.net/science/mathematics-statistics/difference-between-mph-and-knot/ >.